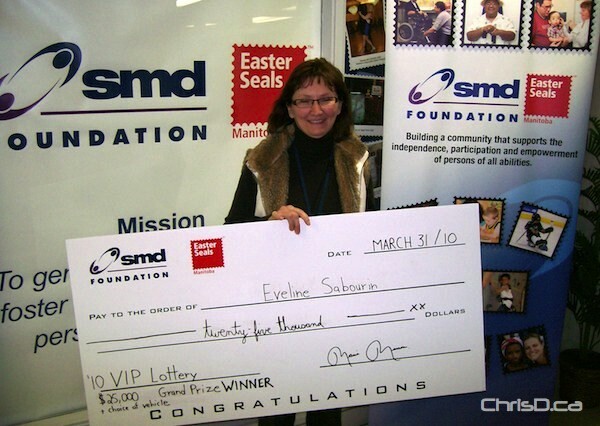 The deadline for the 2011 VIP Lottery Fundraiser in support of the Society for Manitobans with Disabilities is on March 27. A total of 139 prizes are up for grabs, with 10,900 tickets available for purchase. Early bird draws will take place on March 31, with the final draw on April 7. Tickets are $50 each, or four for $100. Last year, Eveline Sabourin (left) won the grand prize of $25,000 and a car. Tickets can be purchased by calling (204) 988-3333 or 1-800-455-6439. SMD provides vital programs and services to over 40,000 children, youth and adults with disabilities in Manitoba.